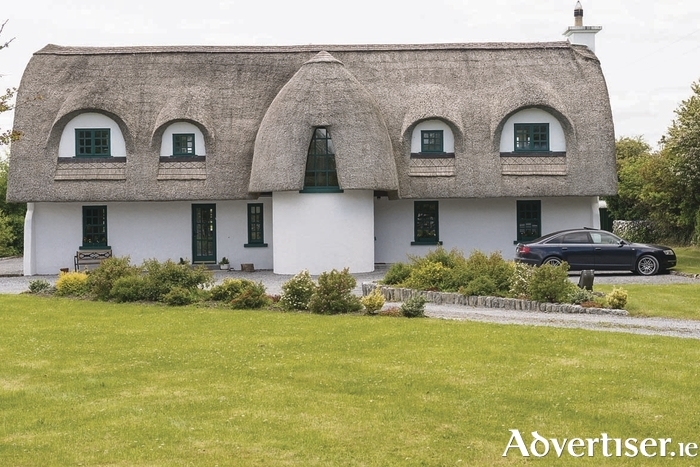 RE/MAX presents to the market a magnificent five bedroom thatched home located in the prestigious area of Maree, Oranmore, Co Galway. This architecturally designed property was built with the finest craftsmanship and is set within an extremely private 1.2 acre site offering the best of country living. St Catherine’s House is approached through a private driveway lined with beautiful mature trees and complete with iron gates. The roof is thatched with high quality Turkish reed. The property extends to more than 3,300sq ft and is spread over two floors. Living accommodation comprises an entrance hall, two living rooms/reception rooms, kitchen/dining room, utility, downstairs wc, landing, two main bathrooms, and five bedrooms, the master bedroom having the convenience of an en suite. To the rear of the property is an extensive west facing garden that includes a south facing entertainment area with access from the main living/reception room and a west facing raised decking area which can be accessed via an outdoor stairs or through the master bedroom on the first floor. Here you can sit and enjoy sunsets over Galway Bay. The rear garden is currently set in beautifully manicured lawns. The property is open for viewing on March 25 from 11am to 12.30pm. For more information contact Martin Healy on 091 330 300. Page generated in 0.1206 seconds.